Hello everyone! Just trying to settle into my new townhome. But everything is almost up and I feel more zen (I think that's the word). I just feel better writing when everything is in its place. Do you guys ever feel like that? Anyways, I was so excited to read this book! I actually read my first book from Roz Chast last year, when one of my former professors assigned it to our Image/Text class. You can read that review here. I was very happy to pick up this book that Chast recently published last year. 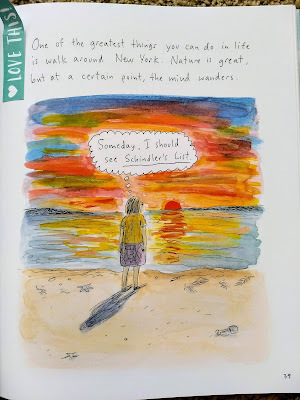 I loved visiting New York and I love Roz Chast, so it's the perfect combo! And with that said, onto the review of Going into Town: A Love Letter to New York! SPOILER ALERT! 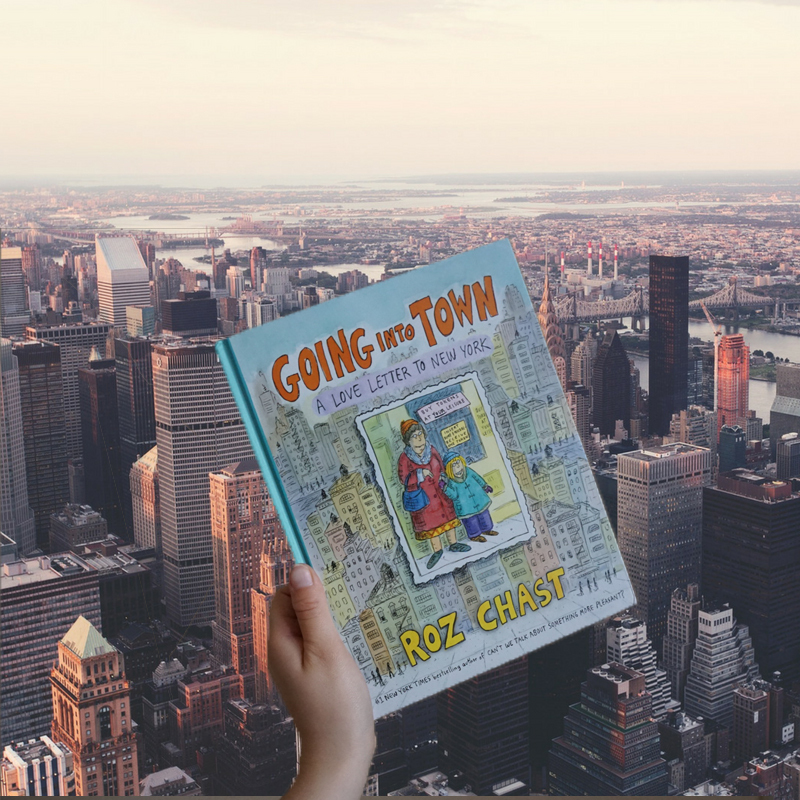 Roz Chast is a published author who grew up in Brooklyn and went to college at the Rhode Island School of Design. She published this book in 2017. Before this book, she illustrated many other books and has had her cartoons appear in the New Yorker since 1978. She continues to write and illustrate to this day. As for the book, this is really an ode to New York. It actually started out as a handbook for her daughter, who was going to live in the big apple. 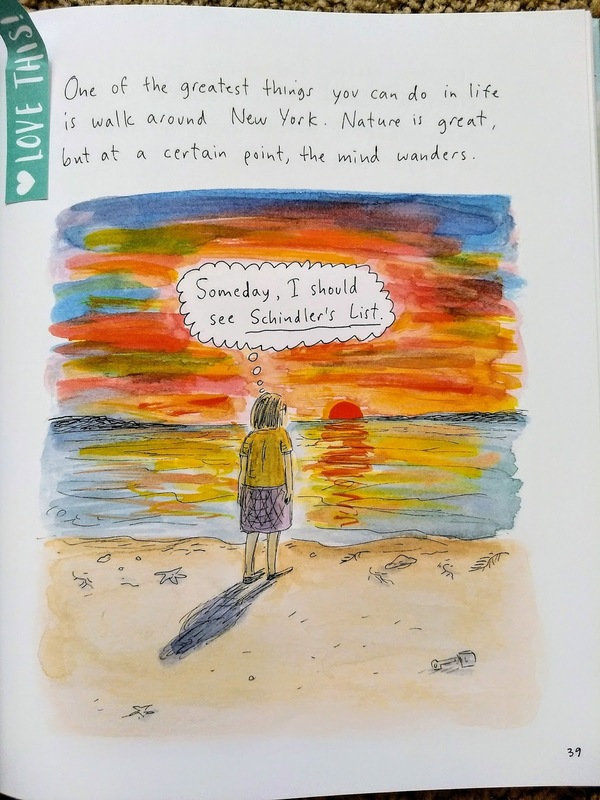 Throughout the book, it really feels like a combination of a survival guide and, as Roz Chast puts it, a love letter to New York. I said this in the last review of her other book, and I will say it in this one, I love the images that go with the text. The images really bring us to what Chast is saying and draws out her memory as she remembers things. The illustrations also give us a proper show and tell of New York. As stated earlier, one might see this book as both a surival guide and a love letter. One can appreciate that aspect, because when someone writes about their hometown, they also write about the places to go, what to do and what to see. They talk about the details and that's what Chast accomplishes in her writing. Lastly, I enjoyed hearing about the changes Roz has witnessed. It's interesting to hear from someone about a place you enjoy and hearing from the perspective of someone who has lived their in childhood. 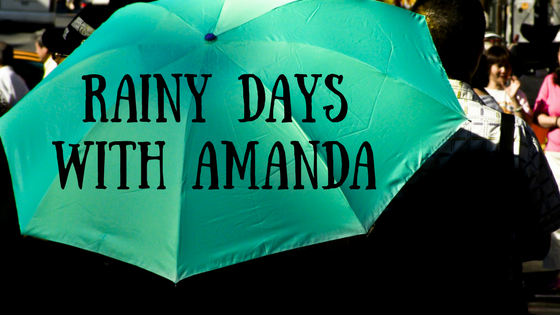 the reader might find it odd and a little comforting on how she embraces those changes, instead of wallows in the past. I can't say there was anything I didn't enjoy about this book. The reader might want to know what happened to Chast's daughter and if she survived the big city, but one will go on with life. In conlusion, anyone who enjoys reading, will definitley enjoy this book. It's different and it's a nice, gentle read for a Saturday morning "me" time. 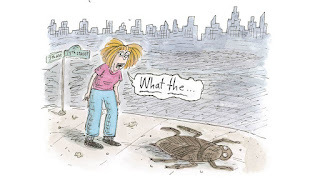 I encourage you to read more of Roz Chast's writing, you just won't find a book quite like hers. You can find out mroe about her and her work on her website. Yep. I moved back home! I think my first rainy thoughts was on being homesick, but now I'm back and I can already tell that I am right where I'm supposed to be. So, I wanted to write a few words about being away and moving back home. Let's go! Being away from home means doing everything on your own. Of course, with technology, you can easily skype, text, call or facetime with people, but it's just not the same. If I had a problem with my car, I was the one looking up places to go, reviews, etc. I was the one deciding what I wanted to eat, what I wanted to do every day and how long I wanted to go without washing the dishes (I actually really don't like falling asleep with the dishes in the sink). Being away means learning more about who you are. Like with the dishes, I learned that I prefer my chicken baked, that I am good at entertaining myself and that I actually like doing crafts and arranging flowers. Would I have learned that being at home? Maybe, but it's definitely what I learned while away. Being away means no safety net. Yes, I lived in a big city where I knew absolutely no one other than my fiance. And that can be a little scary. Yes, I called my mom like every week, texted my friends regularly, but again, they aren't there. There was nobody I could really rely on to pick me up if my car stalled, give me a lift to the store when the car was in the shop or, etc. My fiance and I relied on each other. Being away from home means culture shock. Oh, how I had culture shock when I moved! I mean, it's not a bad thing at all! I just thought everyone knew what real, homemade tortillas and refried tasted like? Being away means being away from family/friend drama. You don't have to be int he middle of it, because you are no there. Therefore, no one can really be mad at you? Being away means sometimes feeling lonely. Being away means not seeing your nephews and nieces grow up, or being there when your grandparents get old. Being away means making your own little world. I say this more with being with my fiance. We lived together in a place none of our friends and family lived in. It was like we were in own little world that only we and some other million people lived. Being back home means breakfast tacos, Big Red, and Tejano music everywhere I go. Being home means comfort food and familiar smells. Being home means being there with the people you love. Let's face it, texts, call, face time, etc, just doesn't replace human contact. Being back home means being birthday parties. Tons of parties. Which means I have no excuse not to get a gift (lol). Being back home means feeling warm and having people you can call up just to grab some lunch. Being back home means being surrounded by people who have a place in your heart because no matter how many times you fight, disagree or whatever, you still can't imagine life without them for one more day. In conclusion, I love being back home. There's no other place I'd rather be. Okay, that's a lie! I meant that there's no other place I'd rather live in long-term. (I would really like to live in New York for a summer and France) I moved back to my hometown and I'm not ashamed. Now, listen to this chill song by Jack Johnson and enjoy! Come back for a new book review next week! It was raining for a week straight here in Texas and the sun is slowly peeking out this week. Even though I love the rain, it was definitely not the best time to move to a different city. But I will talk more about that in my next post. This week, I wanted to share my interview with Matthew Christopher, better known as the guy behind Abandoned America. Abandoned America started as more of a hobby that Matthew enjoyed doing. Throughout the years, it has grown into something more. Matthew believes in preserving the beauty and the history of these abandoned and decayed buildings. As stated on the website, "Abandoned America is committed to partnering with historical preservation organizations, site owners, and communities to ensure that even when it is impossible to retain a historic structure, its unique characteristics, stories, and social impact are not forgotten and can be shared with the world at large." Matthew has two books on Abandoned America. The first book is called Abandoned America: The Age of Consequences and Abandoned America: Dismantling the Dream. He loves photography, museums, traveling and watching the History channel. He is an interesting person and one that I had the pleasure of getting to know. Watch the video below to listen to our conversation including some of his wonderful photography!